Being A Platinum Client Has Perks! 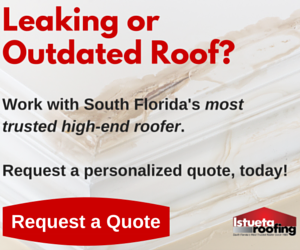 It is extremely important to keep your Miami, Florida roof maintained. With our Platinum Client Maintenance Program, you don’t have to think about your roof maintenance, we do that for you! We will inspect and clean your roof twice every year. We come by once before hurricane season and once after. That way we can make sure everything is ready for the impending storms before they come and then check to see what damage may have occurred after. While we’re there, we clean the gutters and remove debris that builds up in the valleys. We also make sure that everything is still water tight and that there are no broken tiles or failures in accessories. Having your roof inspected regularly extends the life of the roof considerably. How often are you up there? You really have no idea what is happening on your roof and the damage can build on itself. As with most things in life, it is better to take a proactive approach rather than a reactive one. Typically, the maintenance is simple – just an inspection and powerwash. On top of routine maintenance and cleaning, with our Preferred Client Maintenance Program you have priority with us when emergencies happen. This is especially helpful during hurricane season because everyone will want their roof to be restored after the storms. You, however, will have priority and be put at the top of our list. If you are ready for the Preferred Client Maintenance Program, give us a call!